Welcome to our web page on Probate and Estates. When a loved one dies, it can be a difficult and emotional time and putting their affairs in order can sometimes be confusing, stressful and time consuming. It’s not easy having the hassle of trying to work your way through the complexities of administering an estate and often in the process worrying and getting stressed. Need A Probate Solicitor In Northampton? We Can Help. You don’t have to do it all by yourself. We can help! It’s not a problem seeking help and assistance and delegating some aspects of your loved one’s estate to a firm of specialist solicitors like ourselves. In fact, many people use solicitors to sort things out for them. If we can help you even just a little bit, then hopefully you can find some time and space and peace of mind so you can concentrate on more important things such as starting the grieving process and coming to terms with your loss. We offer a free no obligation chat. Simply call us on 0800 3 10 11 12 or 01536 276300 and ask for Adrian, James or Amanda we would be delighted to discuss your situation with you. If you are not sure what to do at the moment, and simply want some further information, then download our free information guide packed full of useful and helpful information. 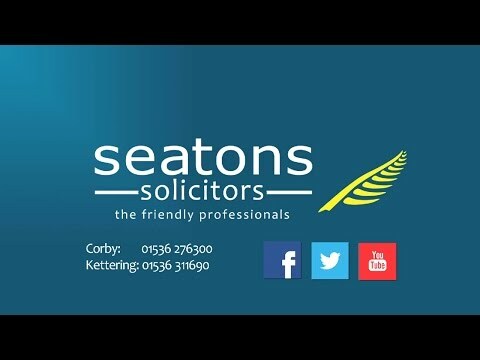 At Seatons we are known as “the friendly professionals” and we care about you and are here to provide a sympathetic helpful and friendly service to help guide you through the legal complexities at this difficult time. Lawyers can charge all sorts of different fees for the work they do. We at Seatons pride ourselves on providing low sensible fees and giving good value for money. Compared with using other solicitors, banks or probate companies you will find our fees very competitive. Where possible we try and charge fixed fees. An indication of our basic fees are set out below. For example, if all you require is to obtain a Grant of Probate for a simple estate with few assets and for you to deal with everything else, then we can charge a fixed fee of only £400 + vat + disbursements which overall comes to around £650 all in. For dealing with the administration of a simple estate including obtaining a Grant of Probate and collecting assets in and paying off liabilities and then preparing estate accounts and distributing the estate to beneficiaries are usually from £1,000 + vat + disbursements which overall can come to around £1,500 all in. With more complex estates then please ring us and we would be delighted to give you a quote. We are very competitive and are confident we can beat most of our competitors. We specialise in Probate and Estate Administration work. We are also a genuine firm of solicitors and are fully insured and regulated unlike many other probate firms you may come across on the internet. We have a “Lexcel Accreditation” which is a legal practice quality mark. We also have accreditations with the Law Society “Wills and Inheritance Quality Scheme” which is open only to solicitors who can demonstrate high levels of experience and expertise. We are also members of “Solicitors for the Elderly”. We act for clients across England and Wales. Wherever you live we can help. We usually don’t need to meet up face to face and can often deal with most matters over the phone or by email. However, if necessary with more complex estates we will travel to meet up with you. We also offer Skype conference calls. So what are you waiting for? Try us! We would love to hear from you. If you have an interest in or own agricultural land and/or property, your estate is likely to qualify for Agricultural Property Relief. The “probate process” as it is known will depend first of all on the value of the estate and secondly if the deceased left a Will or not. It is possible to change the distribution of an estate. Find out more information about this subject here. Any money you gift either in the seven years before you die or in your Will to a registered or qualifying charity, will be exempt from Inheritance Tax. To obtain a Grant Of Probate there are various forms to complete. We can help. If there are insufficient assets to pay the debts and liabilities, there is an insolvent estate. Find out more here. The probate forms normally consist of an Inheritance Tax return and an Oath for Executors or Administrators. If a close relative has died without leaving a Will, this will be required. The Inheritance Act 1975 allows a spouse and dependants to claim against an estate. A Grant of Probate provides authority for someone to administer and distribute an estate. Intestacy is the situation where a person has died without making a valid Will. We are known as the friendly professionals and can make sure that the estate is dealt with both sympathetically and efficiently as possible. It is important to make sure that the right person deals with this.